JNN 24 Feb 2014 Bangkok : An explosion has killed two people and wounded more than 20 others near an anti-government protest rally in the Thai capital Bangkok. 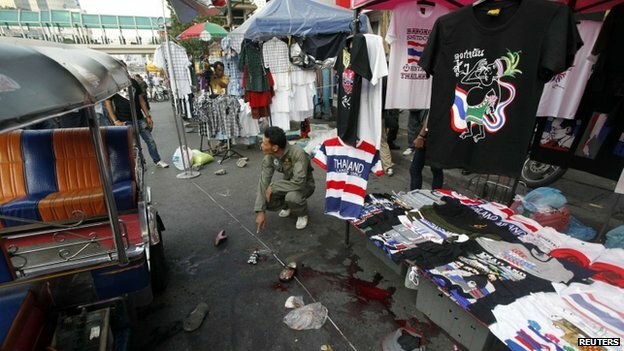 A boy aged 12 and a 40-year-old woman died in the attack near the Central World shopping mall, officials said. It came hours after gunmen opened fire on an anti-government rally in eastern Thailand, killing a five-year-old girl. Thai Prime Minister Yingluck Shinawatra condemned the attacks, describing them as “terrorist acts for political gain”. She said her government would not tolerate terrorism, and ordered a full investigation. Tensions across Thailand have escalated since a wave of anti-government protests began in November. The demonstrators want Ms Yingluck to resign to make way for an appointed interim government, but she has refused. Last week, several people were killed in clashes that erupted in Bangkok when police began clearing protest sites. A protest leader, Sathit Wongnongtoey, said Sunday’s blast in central Bangkok was caused by a grenade. The scene of the attack is near a stage of the People’s Democratic Reform Committee (PDRC) protest site at Ratchaprasong junction. Six anti-government protesters were hurt by a grenade attack in the same area last Friday. In the earlier attack in eastern Thailand, attackers threw explosives and shot at demonstrators at a rally called by the PDRC at a night market in the Khao Saming district of Trat province late on Saturday. Officials said the five-year-old girl had been standing at a noodle stall when the attackers, in two pick-up trucks, opened fire at the PDRC rally. She died from a gunshot wound to the head. At least 30 other people are believed to have been injured. Another child is said to be in a critical condition. PDRC spokesman Suwicharn Suwannakha said the attack had happened during a speech by a party leader, Thai newspaper The Nation reported. He said he had first heard the explosions and gunfire and then saw chairs in front of the stage scattered. “It was chaotic. I saw two pick-up trucks speed away,” he said. No group has so far said they carried out either attack. But the BBC’s Jonathan Head in Bangkok says it appears to be the start of retaliation by the armed wing of the so-called “red-shirt” movement that backs the governing Pheu Thai party. For three months red-shirt activists have watched with growing frustration as the protesters – who enjoy the backing of the military and powerful royalists – have been allowed to obstruct the government and sabotage an election that would almost certainly have been won by Pheu Thai, he says. Red-shirt leaders have organised a mass gathering in north-eastern Thailand this weekend to decide how they should fight back against the campaign to unseat the government. Ms Yingluck heads a government that won elections in 2011 with broad support from rural areas. The anti-government protesters want her government to be replaced by an unelected “people’s council” to reform the political system. They say that Thailand’s democracy has become corrupted and that Ms Yingluck is controlled by her brother, ousted leader Thaksin Shinawatra. In response to the protests, Ms Yingluck called snap elections on 2 February, which her government was widely expected to win. However, the polls were boycotted by the opposition and voting was disrupted by protesters at about 10% of polling stations, meaning by-elections are needed before a government can be formed. This entry was posted in Asia Pacific and tagged Bangkok, eastern Thailand, Thai capital Bangkok, Thai Prime Minister Yingluck, Thailand. Bookmark the permalink.